Take a look off the Oregon coast, and you may see migrating gray whales spouting in between dives for krill or boats fishing for the Northwest’s iconic Chinook salmon. But below that scenic vista lies an environment we still don’t know much about – a seafloor of sand, silt and rocks from which seemingly innocuous but ubiquitous streams of bubbles rise and percolate up through the water column. from scientists – and either go into the atmosphere or remain in the water and add to the growing ocean acidification issue. Scientists don’t know a lot about the reservoirs of methane off the Pacific Northwest coast, first identified in the 1980s. But a team of researchers from Oregon State University and the National Oceanic and Atmospheric Administration (NOAA) has begun a comprehensive study to learn how widespread they may be, how much methane is stored in the deposits and, most importantly, what type of threat the methane may hold. Bob Embley is a geophysicist for both OSU and NOAA who has spent more than five decades studying the geology of what lies beneath the surface waters of the ocean. He estimates he has spent nearly four full years at sea, serving as chief scientist or co-chief scientist on 37 expeditions involving various ships, remotely operated vehicles (ROVs) and other submersibles. To paraphrase the old E.F. Hutton commercial, when Embley speaks, his colleagues pay attention. His message on methane is to the point. It isn’t an idle concern. The methane appears in two forms – either as bubble streams or as hydrates, which is a solid form of the compound that looks like chunks of ice. Below 500 meters in depth (about 1,600 feet), the methane is often found as solidified hydrates in conjunction with gas bubble streams. Above 500 meters, the methane always appears in the gas phase as bubble stream rising from the seafloor. If the methane gas does not form hydrates as readily because of warmer water, it could alter how much methane the ocean floor sequesters and how much it releases. If the source of the methane is the breakdown of hydrates, warming temperatures may push the “melting point” or what is known as the hydrate stability zone deeper than 500 meters, leading to the breakup of previously stable hydrate, and the release more of the potent greenhouse gas. Either way, a warmer ocean appears to be a cause for concern. Three-plus decades ago, OSU oceanographer La Verne Kulm and his colleagues found a handful of methane seeps off the Oregon coast, and a decade later, another group of researchers documented a significant reservoir at a site since dubbed Hydrate Ridge. 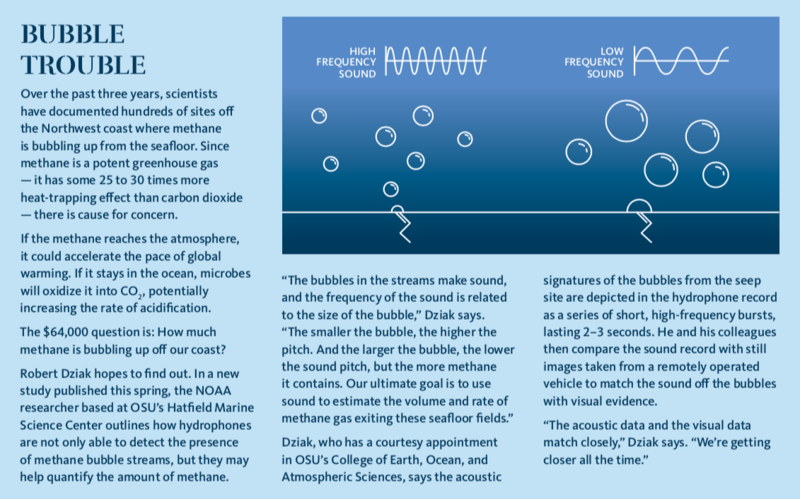 Many of these early serendipitous discoveries were prompted by fishermen, who spotted anomalies on their fish-finders that turned out to be acoustic reflections of bubbling methane gas. The haphazard nature of discovering methane bubbles resulted in the documentation of just a hundred or so “seep sites” along the Northwest coast by the year 2015. That all changed over the next two years, as the OSU/NOAA team began systematically hunting for sites, aided by new sonar technology aboard the Exploration Vessel Nautilus, which is owned and operated by the Ocean Exploration Trust. 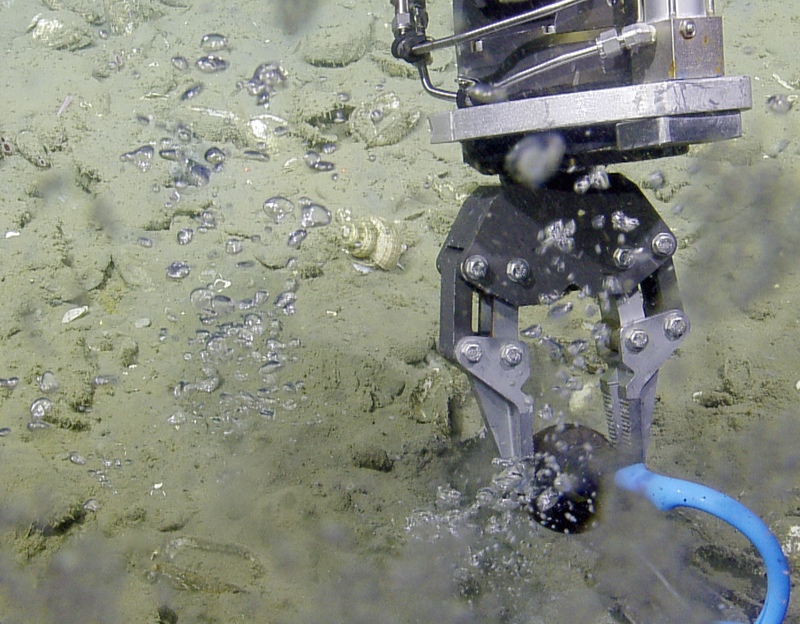 The researchers were surprised to locate methane seeps all along the coast. By the time they concluded their last research cruise in 2017, they had expanded the number of documented sites to more than a thousand. “Let’s face it, we’ve mapped more of the moon and Mars than we have of our own ocean floor,” says OSU oceanographer Susan Merle, who led the mapping portion of the expedition. The discovery of methane in shallow water is of particular concern because it makes it more likely the gas could reach the atmosphere before microbes oxidize it into carbon dioxide. Although CO2 is bad enough, methane is 25 to 30 times more potent. So, the researchers scheduled a research expedition in the summer of 2018 to search for shallow-water sites and in hopes of retrieving pure samples of the methane to test for its origin. The team conducted 13 dives from Northern California to the Washington border, using the ROV Hercules on the E/V Nautilus, which was supported by the NOAA Ocean Exploration and Research Program. They used the ship’s multibeam sonar to locate 96 previously unknown flares that indicate bubble streams on the seafloor. They dove at three shallow sites (100 to 150 meters deep) on the Oregon coast at Nehalem Bank, Heceta Bank and Coquille Bank. All of the sites had microbial communities, known as bacterial mats, occurring in patches close to where the bubble streams entered the ocean. These bacterial mats utilize the methane to power their metabolism, forming the base of unique seafloor communities. But it is what the team took away from the seep sites that excites them the most. Months before the 2018 summer expedition was to begin, Lupton worked with an engineer in California to design a prototype hydrate sampler, which they hoped would attach to the ROV to collect samples of methane hydrate. Other researchers have collected samples, but virtually all of them had some level of contamination before having them analyzed. Baumberger and her colleagues collected 170 samples of methane gas, hydrates, seep fluids, seawater, sediments, fauna and rocks. The prototype sampler works by taking a small core of hydrate and keeping it sealed under pressure so no gases can escape before they can be analyzed onshore. Baumberger said she hopes to have the results by late fall of 2018. There is another side to the methane story. The researchers say industry representatives are also interested in the new data as an indicator of deep gas and oil reservoirs. Drilling is problematic off Oregon, and direct mining of the hydrate reservoir even more so. Although they have yet to figure out how much methane is off the coast, it appears to be abundant. Could it be a benefit instead of a liability? “That’s a tricky one,” Embley says. “It is very complex – and potentially hazardous – to attempt to extract methane hydrate on any kind of large scale. Mining would have all sorts of implications. Right now, our focus is on trying to determine where the methane is and how much is out there. We also need to quantify what happens to the methane that is released, and what could happen during an earthquake, or as the ocean warms.